Just got back from a one day trip to San Diego to visit the folks who run CAMERA, the metagenomics database being run out of CALIT2/JCVI. The main point of this meeting was to start to figure out how to take computational tools that we have developed in my lab or will develop in my new iSEEM project (with Katie Pollard and Jessica Green) and make them available in CAMERA. But as usual, the most fun part of the trip was to see the CALIT2 toys. And boy do they have toys. Larry Smarr, the director of CALIT2 and the PI on the CAMERA project (funded by the Gordon and Betty Moore Foundation) gave us a quick tour around the building. My slide show is embedded below. Mostly we got to see the massive multimonitor “optiportal” display walls. 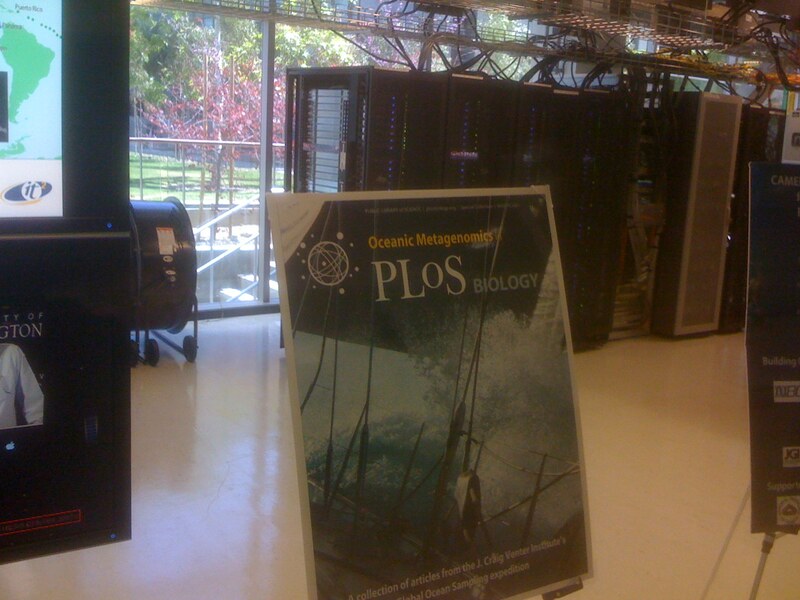 We also got to see the big linux cluster that is the guts of CAMERA (and may favorite part, of course – the big PLoS Biology sign relating to the Global Ocean Survey papers in front of the computer). CAMERA, which stands for Community Cyberinfrastructure for Advanced Marine Mic robial Ecology Research and Analysis (thus, why we say CAMERA), is a big and complex enterprise, hosting metagenomics sequence data, metadata associated with the sequence, and a variety of analysis tools for working with the data. You can find out more about it in a paper from PLoS Biology here. Now, CAMERA is not the only metagenomics database out there. The other main one people seem to use is IMG/M from JGI. If you are interested in metagenomics analysis in any way, it is worth becoming familiar with both systems. Author Jonathan EisenPosted on April 20, 2008 April 10, 2017 Categories Misc.Tags metagenomics, Misc. You know, for someone that is so into open source access, I am constantly surprised that you support CAMERA or IMG/M. Neither are open source for either their code or their data. Neither provide free, unrestricted access to tools. In fact, as far as I have been able to figure out you can’t even link in to either database directly.Not exactly OPEN, in any sense of the word.There are open source alternatives out there. Of course you know my favorite. Here’s a link to what a real open source system should look like. < HREF="ftp://ftp.theseed.org/" REL="nofollow">Code, data, everything out there<> for all to share. Actually, Rob, lame as it may sound, I did not know that about the Open Source …On our trip to CAMERA I did ask specifically about future developments and if they would be open source and they did say yes. But I did not even think about the current version. I can only say I hope in the future it will be more Open Source. Maybe some of the readers involved in CAMERA can post about this.My main political issue has been Open Access to publications. But I agree that Open Source software and Open Data are also important. So — thanks for posting.I should note — all software developed in my lab in the future, including all work on my new metagenomics project, will be developed Open Source. And as much as possible, all data I produce will also be released as rapidly as possible. And I will try to do my best to support, encourage and WRITE ABOUT — truly open projects whenever possible. So thanks for keeping my on my toes. FYI: All of CAMERA’s source code is open source — http://sourceforge.net/projects/bio-camera/ Regarding the data: CAMERA’s data access policy is driven by international treaty obligations. Registration is driven by the requirements of the Convention on Bio-Diversity, and meant to ensure that marine researchers continue to be able to collect samples. You can actually poke around on camera through all of the annotation data without being registered, but you have to login to see the sequence itself or use the tools. There are no restrictions on redistribution of CAMERA data, as long as you cite country of origin. Thanks Saul. I tried to ask around but never got a satisfactory answer to post here so it is really good that you posted and provide the Sourceforge link, etc.